After growing up in Southern Ontario Graham trekked across the country and spent a few years enjoying the outdoor life that Whistler, B.C. has to offer by skiing, mountain biking, playing rugby, and meeting his future wife carving the snowy slopes and sipping fine wines. Having grown up in British Columbia Lyndsay has been aware of the fine grape growing conditions the Okanagan Valley has to offer since the onset of her own wine passion. 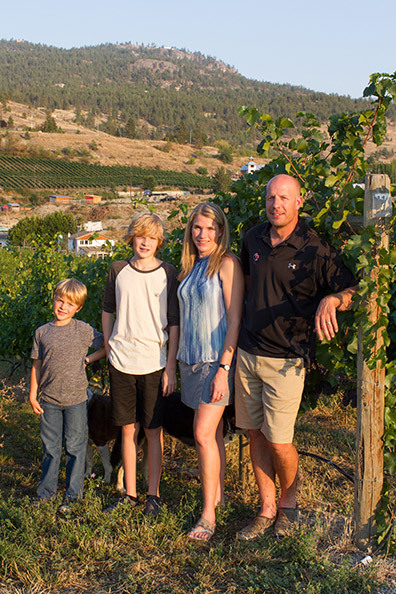 Once the couple had their first child they decided that the environment of the Okanagan would be ideal for cultivating a family as well as their dream of a winery. Initiating a formal education on the subject of how to best cultivate the vines that produce the wines they love, they discovered that the vineyard life and winemaking were passions that they shared and wished to further pursue in their life together. The growing family relocated to New Zealand for a more advanced and thorough education on this subject that has proven to be their life-focus. Having attained honours degrees in both oenology and viticulture while studying in New Zealand at Lincoln University, Lyndsay and Graham made a welcome return to the Okanagan Valley, settling on the Naramata Bench in 2007. Since that time both have been hard at work honing their skills and practicing their trade, enabling that they can excel in their chosen profession. Lyndsay has traded in her snowboarding boots for a pair of Wellies, and was been an outstanding, award-winning winemaker for the Ruby Blues Winery along the Naramata Bench from 2009 to 2014. In 2012 and 2014 Ruby Blues won the Lieutenant Governor’s Award for their 2011 and 2013 Viognier. Lyndsay has now turned her focus to Tightrope Winery full time and continues to craft award winning wines in the new Tightrope facility! After their return to Canada, Graham went to work for Mission Hill Winery as one of their lead viticulturists. Managing numerous acres of different varietals successfully through many seasons allowed Graham to put into practice those hours of study, and he has stowed the mountain bike in the garage in favour of overalls and a tractor. 2012 saw Graham leave Mission Hill to focus on the O’Rourke’s own 10 acre property along the Naramata Bench at Fleet Road. Walking the tightrope of a life-in-balance, in her free time Lyndsay enjoys training for the triathlons that are hosted in the region, while Graham still sports his rugby cap once in a while. The Fleet Road Vineyard, in addition to its’ vines, is now growing not one, but two fantastic little boys! A variety of family pets can also be found on the farm and are sure to be seen on the next Vineyard Dogs of the Okanagan Calendar! Lyndsay and Graham look forward to sharing with you their enthusiasm and life-long dedication to wines that are worth walking a tightrope for.